You may not know Greg Canessa, but Xbox 360 owners are probably using something he created everyday. Canessa has had his hand in creating many things for Microsoft like achievements, match making and Xbox Live Arcade before moving onto Pop Cap Games for a brief stay. Now with Blizzard, Canessa is the projector director for the upcoming Battle.net update which will see plenty of enhanced features for StarCraft 2 and eventually Diablo 3. Greg explains how the new Battle.net is a tiered system - with always connected support, as well as a social and competitive arena. 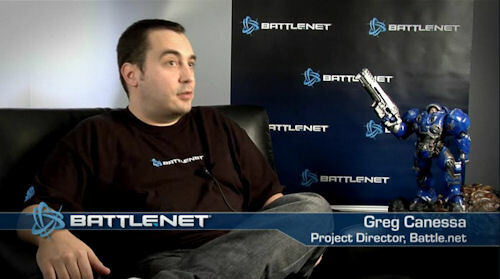 It appears like Battle.net will borrow heavily from Microsoft's platform with included matchmaking, which Greg claims may be the most advanced in the industry. Battle.net will also support achievements, friends lists, and competitive ladders. Finally Battle.net will include mod support, something that's going to be heavily utilized in StarCraft 2, for custom content. These mods will go into a marketplace for everyone to enjoy, and from what we hear, the StarCraft 2 mod system is nothing short of amazing. It shouldn't be long before some folks create some incredible cooperative modes above and beyond the comp stomping that will be available when the game launches later this year. There's a full video preview available on the official StarCraft 2 site, so be sure to check it out.